I'm always wary of commuting by an auto-rickshaw when I'm outside Mumbai. The working meters make it a bit simple in Mumbai - the catch being that one must insist on using the meter and even then there have been attempts to fleece near airports and railway terminals. One needs some thick skin to ensure that the right fare is being charged. Outside metros though, working meters are a rarity. And when a person strolls in with a ragged t-shirt and a backpack - typical backpacker/tourist wear - one can literally sense the rickshaw-wallahs drooling at the sight of an easy prey. So, I'd prepared myself to haggle strongly as I set off for my trip through southern Rajasthan in early January of 2016. 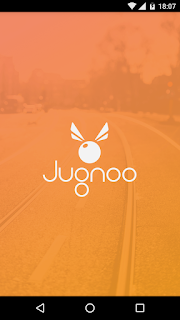 Our hostel manager at Backpacker Panda Udaipur introduced me to this app - Jugnoo. Apparently I've been living under a rock for a while, as this app has gained quite a buzz. The idea is as simple as the regular Ola/Uber cab hailing services, but applied to auto-rickshaws. Payment - calculated as per distance traveled on the GPS - can be made by Paytm or cash. The app - as I read - has also started a local grocery delivery service using the same network of auto-rickshaws. My first ride was from the hostel to the Monsoon Palace - a distance of about 5 kms. The total fare was about Rs. 40, but waived off since it was our first ride. And Paytm gave some sweet cashback too. The distance from the Monsoon Palace to the City Palace was almost similar. The price quoted by the rickshaw-wallahs at the stand was Rs. 100. 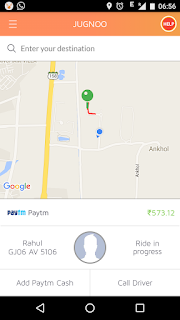 Common sense prevailed and I hailed a Jugnoo for a ride which cost me Rs. 36 after factoring in the Paytm cashback. A 64% saving. Take that you fleecing pot-bellied-good for nothing-smirking rickshaw-wallah! Yeah! I followed it up with a two more rides that day. The next day I'd to leave the hostel early at about 7am, but there were no Jugnoos on the road. So, I had to fall back to the classical call-Pintu-from-the-next-block routine. This was not a shock in anyway, as is it unreasonable to expect anyone on the road at such an early hour. I extended my Jugnoo-riding at Kota too. It started well, but then I was faced with a small problem - ride refusal. 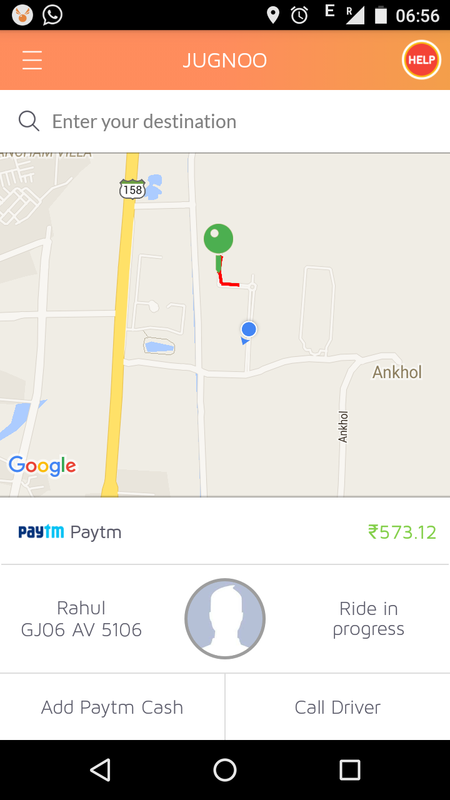 I'd request an auto from my location, my request would be accepted, the driver would call me up and then reject the ride if he did not like the destination. This happened thrice in a row at a particular place in town and so that ride had to be completed through the classical routine. That was incidentally my last attempted ride through Jugnoo at Kota. At this moment we reach the hostel where I alight . My thought train is now occupied by that stupid "Free Basics" debate ... Free internet for these guys anyone? 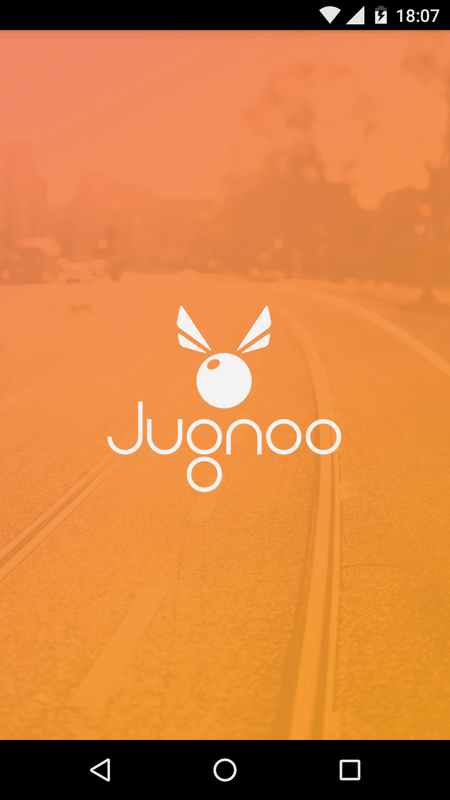 I used Jugnoo at Vadodara just before publishing this. A cumulative saving of more than 50%, and the drivers were generally happy too.